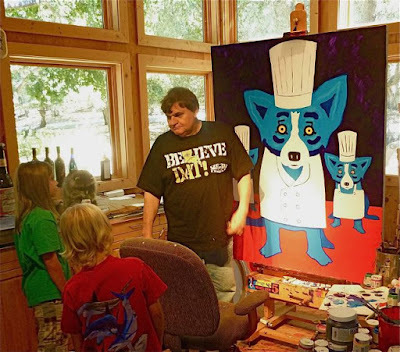 Originally I planned to spend this post talking about George Rodrigue’s childhood in New Iberia, the fact that he was an only child, along with his lack of art influences, as well as our devotion to arts education. 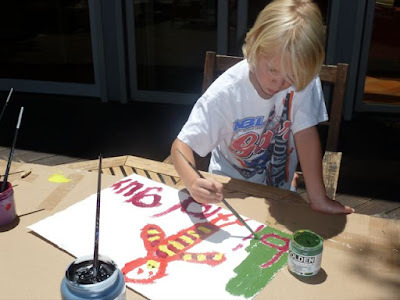 But I’ve covered his childhood already in previous posts, as well as the George Rodrigue Foundation of the Arts. 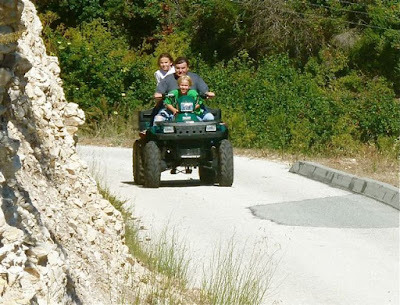 Maybe it’s time --- summertime, family time --- to talk about the children in our lives today. As I’ve mentioned before, George and I do not have children of our own. However, he does have two grown sons, André and Jacques. We’re headed on an Alaskan vacation with them in the next few weeks, and I’ll write more about them at that time. This does not mean, however, that we don’t have young children in our lives. William (age 9) and Wyatt (also called Bubba, age 7), our nephews, are an inseparable part of our holidays, our major decisions, and our future. 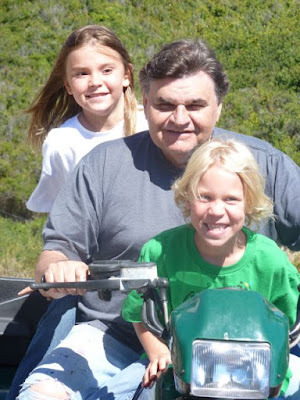 This past week in Carmel, California, they were also a part of our daily lives. “Does that pistol work?” William asked, as he looked around the studio. “Why do you have so many raccoons?” asked Wyatt. At last George set them up outside, as he’s done many times in both Carmel and New Orleans. He uses his supplies, stretched canvas or 100 pound deckeled-edge watercolor paper, along with acrylic paint and brushes straight from his bucket of water. 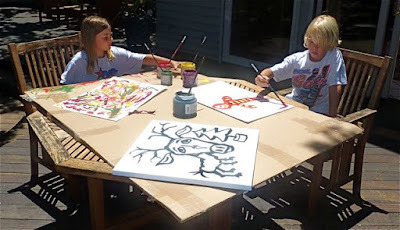 They create with supplies the likes of which he never knew as a child, and they appreciate it. 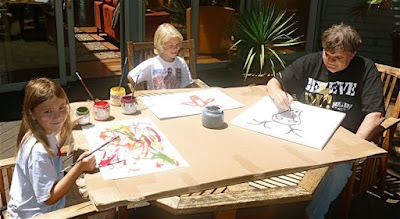 They don’t recognize their uncle as famous, but they do understand that he’s a great artist. They think every artist lives well and enjoys shows at major museums. Fortunately, they also understand that it takes hard work, talent, and, as we discussed in great detail this week, a lot of luck. “Is that a Birdman?” I asked Bubba. “What are you painting?" I asked William. The great artist (the big kid) grabbed some paper and joined them. “You gonna give him a red nose?” I asked. “I doubt it,” mumbled George. “Good idea, Aunt Wendy,” they said together. We talked about dreams, about knowing what you want to be when you grow up. I told them about Uncle George, sick with polio at age nine, about the paint-by-number sets and modeling clay that cured his boredom and set his course for life, something they understood after William's long months in a body cast (detailed here, and pictured below). We talked about dedication from an early age, the kind of dedication that shapes a person in adulthood. And then we talked about their dedication, about bicycle motor cross, the Olympics, the varieties of ants in our backyard, as well as the recent changes in personality in their pet frog, the speed of Uncle George’s four-wheeler, and the number of sea dragons at the Monterey Aquarium. “A motorcycle stuntman like Evel Knievel, but more daring." “And you, Wyatt?” I asked. “I’m going to be a scientist," he replied. "They don’t recognize their uncle as famous, but they do understand that he’s a great artist." I love this quote!!! Anybody who truly knows George doesn't recognize him as famous. We recognize him by his compasssion, a great story teller, a brilliant man and of course, can't forget....he tells the best jokes!! There are many other great qualities he possesses but, I would be here till midnight writing about them. People are very fortunate to become his friend as well as, his wife's Wendy's. Life is good when you are in there presence their enthusiasm is contagious!! I love it! The boys are so fortunate to have such a wonderful uncle and aunt!!!!!!!! Love it, Smiling ear to ear.